In the end, it was the casual bat toss after the follow-through. Just sort of a shovel pass to get the piece of ash out of the way, the coda to a compact swing, the dot on the i that was a well-struck sphere of horsehide. I found that it crept its way into my own swing. First, it was the flip of a yellow plastic wiffle ball bat. Then I did it with a 26-ounce or 28-ounce aluminum bat in Little League, on the rare occasions I hit a ball on the screws in the first place, the kind of stroke that justified such a subtle flourish. Finally, as I grew older and settled into suburban mediocrity, it was with a 32-ounce Easton softball bat, the weapon of the workaday warrior. But a laser shot from the sweet spot? That spry push that sent the bat suspended for what seemed like an eternity, a gently falling space station from Kubrick’s 2001, Strauss providing the soundtrack. That was Jim Rice to me. And that flip is embedded in whatever part of my brain controls my motor skills, such as they are. I still do it now, 20-plus years after I ever saw it on a consistent basis. 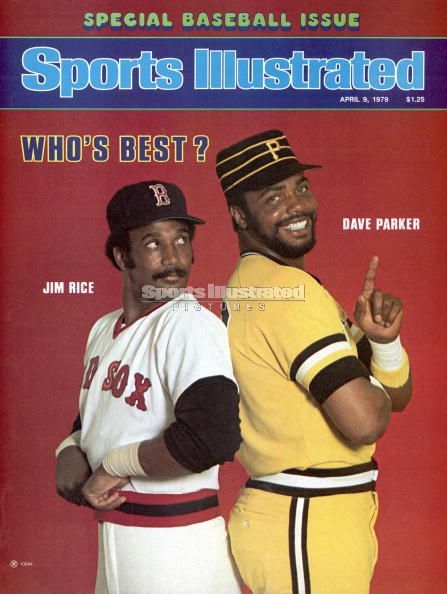 Jim Rice wasn’t even my guy. Yaz was. I was old school like that, even at 7 or 8, and I felt that Yaz was the respected elder of the team and he warranted that deference. The other players? Hey, they were great and all, but Yaz… he was the one the Greeks would have written about. Probably so, but little did I know at that age that Rice was a guy they’d celebrate, too. A man of such natural strength. I laugh today because in all the highlight reels we’ve been inundated with this past weekend, Rice actually seems small. Not tiny, but he wasn’t a hulk. He wasn’t 6’ 4”. He didn’t have improbably bulging arms. 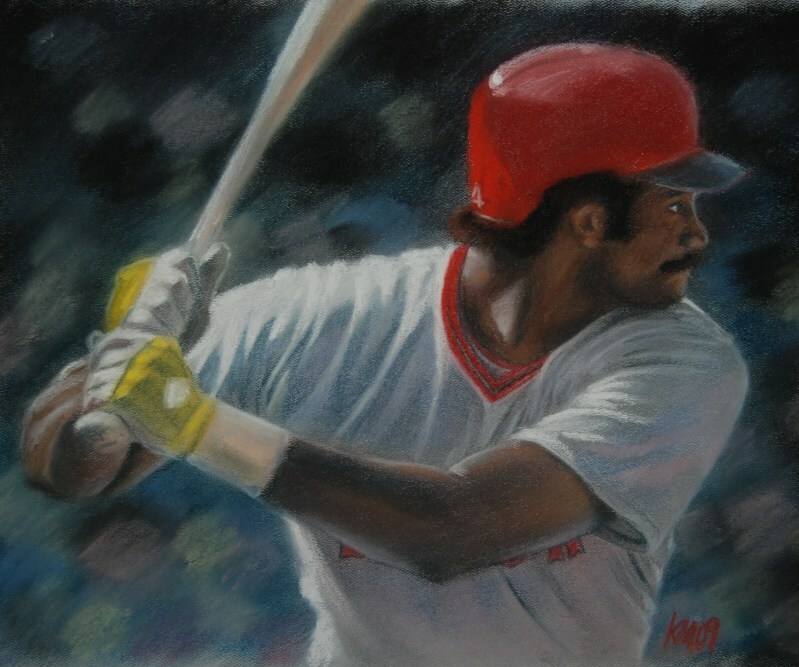 There’s a Sports Illustrated cover from 1979 with him and Dave Parker on the cover, and you might look at it and in comparing the two you’d think to yourself, This is man who 46 home runs and 15 triples the year prior? Ballplayers from yesteryear look fairly shriveled compared to this era’s ‘roided up monstrosities, but here’s Rice standing next to a peer. But nobody said he was small or wiry then, because he wasn’t. He wasn’t Hank Aaron, an everyman whose extra gift was lightning wrists, he was a strongman in a normal-sized (if incredibly fit) body. But he wasn’t my guy. Nobody other than Yaz was. And by the time Captain Carl retired, I was 12 and too old to direct that child-like awe towards another player. By then I was wise enough to see behind the curtain and realize that it was just laundry that we were rooting for. Rice signed with the Sox three weeks after I was born. His induction into the Hall of Fame happens at another curious moment in my life, one where I still feel like I have a lot to offer this world in one way or another, but the basic path has been chosen for me at this point. It’s how I work within that path that will dictate the rest of the story. “Have you drawn him?” This apparently is a sign of legitimacy. 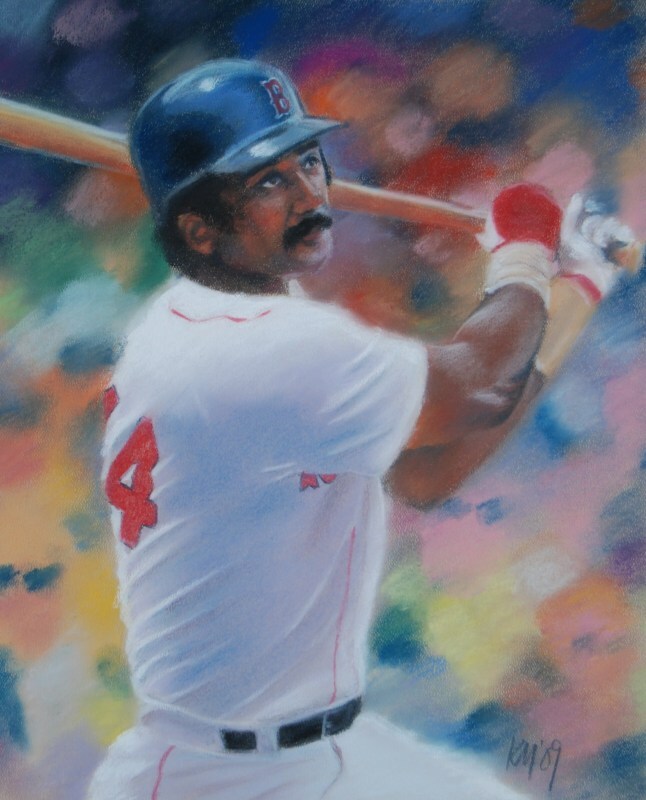 And I looked at the TV screen as Jim Rice sent a frozen rope into the corner, tripling as he chugged around the bases in a polyester double-knit road grey V-neck, bold red helmet leaving a streak in the bad late-70’s video production. He played when I was a boy.